After an interregnum of three years, the 2017 Whitney Biennial has arrived and with it, the usual insistence by the city’s culture pages and art-world stakeholders that attention must be paid. Critics like yours truly dutifully attend, hoping for the best, but also wondering why a subjective selection by a handful of organizers necessarily constitutes a definitive snapshot of contemporary art, which is how the show has always been sold. It doesn’t, of course, though that hasn’t stopped people from thinking otherwise, especially since the Biennial has the felicitous effect of stove-piping careers into wider art-market and museum acceptance. This year’s edition is notable for being the first in the Whitney’s meat-packing district home and also for being a relatively intimate affair, with only 43 artists making up the roster. Though show’s total square footage exceeds that of previous Biennials that swallowed up the museum’s old Madison Avenue headquarters, the exhibit here takes up only two floors, plus the small public gallery off the entrance, giving the proceedings a sense of focus that is certainly welcome. Less is definitely more in this case. What else? At ages 36 and 34, respectively, curators, Christopher Y. Lew and Mia Locks are young for the job, arguably making 2017 the first truly millennial Biennial of the millennium. Indeed, while Lew and Locks represent the first time that the Biennial has been helmed entirely by people of color, they eschew identity politics, settling instead for a tone in which irony is out, along with aggressive attitude (minus some exceptions). This is true even of some of the politically engaged art. Also remarkable is the surfeit of paintings (more than I can recall from earlier Biennials) and the amount of breathing space given to them, with some artists being practically accorded rooms of their own. One is Carrie Moyer, whose abstractions of overlapped biomorphic shapes toying with pictorial space make for a serene show-within-the-show. The same goes for Shara Hughes canvases, which filter Fauvist landscapes through a outsider art sensibility. Spread around one of the larger galleries, Tala Madani’s weirdly scatological depictions feature things like a baby reaching for a pair of breasts made of feces and a disco interior lit by naked men shooting spotlights out of their rectums. Nearby, Henry Taylor’s vignettes of African-American life are big, bold and imposing, mixing the everyday with the tragic. One work in particular hits in you in the gut with an image of a black man slumped dead in his car after a police shooting. As far as blows to the solar plexus go, however, nothing beats Jordan Wolfson’s vertigo-inducing, virtual reality showstopper. It invites you to don goggles and headsets to watch as a man with a baseball bat (Wolfson himself) beats the head of kneeling figure (actually a life-like robot) to a bloody pulp. The incantation of a Jewish prayer precedes the mayhem, giving it the historical resonance of the Holocaust as the scenario plays out in broad daylight with cars and pedestrians passing by. Wolfson’s VR technology offers a 360 degree field of view, allowing you to look up, down and most relevantly, away. Forcing you into a moral quandary of whether or not to bear witness to events, Wolfson’s work is a tour de force that erases the barrier between movie violence and the real deal. 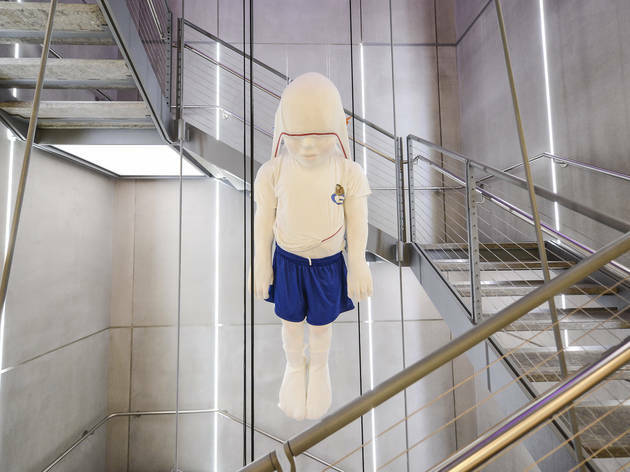 Other installations of note are site-specific and include Ajay Kurian’s transformation of the Whitney’s stairwell into a surreal vision of chimerical, animal-children hybrids rappelling up and down ropes that run from the top floor to the basement. Samara Golden frames a view of the Hudson with one of her M.C. Escher-esque tableaus of mirrors and furnishings that explode your sense of spatial orientation, while Raúl de Nieves wraps questions of faith in candy-colors with an ensemble of beaded ritualistic figures fronting an expansive stained-glass mural. Working together as the collaborative duo KAYA, Kerstin Brätsch and Debo Eilers fill their corner of the Biennial with a collection of wall reliefs, hangings and sculptures, each an Expressionistic mess of melted plastic, leather straps, oversized grommets, paint and stainless-steel towel bars. A series of booths tiled on the inside reinforce the sense that you have stumbled upon a combination of S/M club and science experiment gone awry. As for video and photography, both mediums have dominated previous Biennials, and they’re hardly underrepresented here. Examples of each that stuck in my mind were Anicka Yi’s filmic excursion through the Amazon in search of medicinal plants, and John Divola photos of abandoned student artworks hung in abandoned buildings. They’re poignant testimonies to thwarted dreams, not just in art, but in life. As it turns out, blunted ambitions and the economic conditions that cause them is the subject of an installation by Occupy Museums—a collective that has made it its mission to expose the complicity of cultural institutions in the machinations of globalism. Located in a large space crowded with a cheek-by-jowl hanging of artworks that recalls the heady, everything-including-the-kitchen-sink spirit of Biennials past, Occupy Museums’s work is basically an infographic that requires sustained reading. But in a nutshell, it explores the confluence of money, art and real estate in New York (and increasingly elsewhere) that has made it all but impossible for artists to create and survive. It’s most riveting element is a roll-call of artists and the debts they’ve incurred in their struggle for recognition. One could say that maybe their work isn’t all that good, but frankly, the piece also suggests that quality has less to do with success than an ability to make savvy connections, a talent that may account for many of the artists landing in this Biennial. Admittedly, this has been the case since time immemorial, but there was a moment when the art-world was smaller and ideologically driven, tying self-selection to idealism, or at least to a sense that there are more important things than money. That’s impossible now that cultural expression flows almost exclusively from the largesse of the .001 percent. 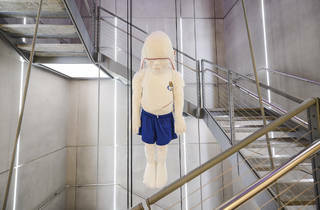 Both the Whitney and its Biennial are creatures of that. One can certainly laud Lew and Locks for including Occupy Museums—and cheer on the group’s point—without denying that this state of affairs diminishes their piece in a way. Globalism is insidious in that respect, one of many reasons for the ethno-nationalist backlash sweeping the Trans-Alantic world. But inadvertently, Occupy Museum calls attention to the difference between this Biennial and the last, a distinction that sits squarely in the nexus of power and art that their piece investigates. In the period between then and now, the Whitney escaped its also-ran status to become a player in an institutional landscape dependent on big donors and tourists attracted to the same thing—a shiny statement building. The museum is to be commended for showing restraint in using its facility, and for trying to strike a balance between its role as a custodian of art and the compromises that follow. It will be interesting to see where the Biennial goes from here. I spent about 2 hours looking at some of the art in the Whitney Biennial. I was completely unimpressed. I thought the works were expressing a "political correctness" in that they appeared to have an ethnic bias ... at least the works I wandered by ... lots of blacks and people of color portrayed. I thought most of the works I saw were also amateurish or "gimmicky." It appeared to be pandering or catering to people of color. The previous weekend I had wandered thru Art Expo. What a difference! No comparison. In my opinion so many of the works in the Biennial I saw, if they were out in the street, would be passed by as trash. Not so at Art Expo. The works there were inspiring and visually beautiful. I thought many of the works I saw at the Whitney should be gathered up and placed in the garbage. .